We’d love your help. Let us know what’s wrong with this preview of Meltdown by Rick Wayne. 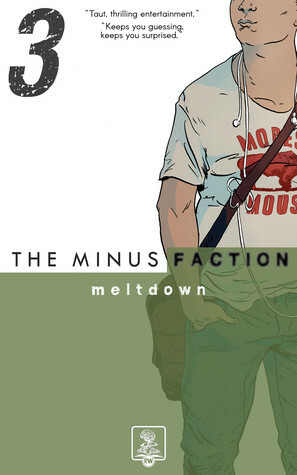 "The Minus Faction" is a super-powered speculative thriller in seven novella-length episodes. In Episode Three . . .
After losing his girlfriend and his job, Ian Tendo’s sensible life has fallen apart. When he’s arrested by the FBI, he doesn’t imagine things could get any worse. That is, until dark forces recruit him to be an agent of terror. Forced to commit horrible acts in secret, Ian knows death is close—either at their hand or his own. To ask other readers questions about Meltdown, please sign up. These are a quick read. They're episodic, developing an overall plot arc, so you can't really jump in in the middle. That's not a bad thing, but it is a thing which needs to be mentioned. Once again, I was swept along in the story Wayne has created. This one is big on intrigue, as the new protagonist Ian finds himself on a terrorist watch list for no reason that he can fathom. He’s a sort of “every man” character, who’s devastated by his recent breakup when his life gets further complicated by the FBI and secret organizations. And then a foul-mouthed, super-intelligent 11 (and a half) year old girl comes into the picture – and, well, I think Ian was swept up in the story, too. The Once again, I was swept along in the story Wayne has created. This one is big on intrigue, as the new protagonist Ian finds himself on a terrorist watch list for no reason that he can fathom. He’s a sort of “every man” character, who’s devastated by his recent breakup when his life gets further complicated by the FBI and secret organizations. And then a foul-mouthed, super-intelligent 11 (and a half) year old girl comes into the picture – and, well, I think Ian was swept up in the story, too. There are a lot of fantastic events along the way, and the characters from all three stories come together at the end of this one. In the style typical of the series, you've got twists, turns and a seriously nasty baddie. This book also starts digging a little deeper into the overall plot of the series, turning the hints and tidbits from a drip to a stream. If by this book you're not hooked on the series, there's something wrong with you. Another good read in the series, and keeps me interested in finishing the series.